Lucy Bainbridge founded Bainbridge Print Studios in August 2008. 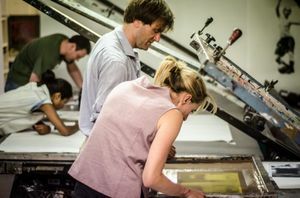 The studio provides open access print facilities seven days a week for both screenprint and intaglio, artist studios and desk spaces and a varied programme of workshops taught by professional artists and designers. Our ethos is very much about facilitating a fun, supportive and critical environment for those practicing within the parameters of contemporary art and textiles. With this in mind, we hold regular open studios and have developed a strong programme of workshops that welcome those of all abilities at all stages of their career. This provides a strong framework for open access members and studio artists to share and present their work with each other and with the public. The studio is committed to widening access to contemporary art and print and believes in the value of engaging with individuals and the local community. As such we regularly help to organise artist-led projects and activities in the local area. As a team of professional printmakers and artists we welcome the opportunity to work with you on unique commissions and special projects, so please feel free to get in touch to discuss any projects you might have in mind. You will find us in both West Norwood and Elephant and Castle, South London. All courses and open access facilities are based at our Elephant and Castle studio only.